The Crook County Cowboys showed just how deep their team is Wednesday afternoon as they were able to defeat both the Bend Lava Bears and the La Pine Hawks in a three-way track meet held at Punk Hunnel Stadium in Bend. "It was a good meet for us," Crook County head coach Ernie Brooks said. "Team wise, we didn't load up to say, 'Heh, we are going to go win a dual,' but the boys still pulled it out." The Cowboys showed the kind of depth that they have as they were able to edge Bend despite missing key individuals due to minor injuries and illness. The Cowboys scored 83 points to edge Bend with 79, while La Pine struggled to score points, finishing a distant third with just 7 points. Although the Cowgirls did not fare as well, Brooks was still pleased with their performance. "The Bend girls are pretty darned good," Brooks said. "If you think about it, this is basically our first full meet, getting all of the events in and getting our first full meet in, and our kids did good. They responded." Bend amassed 122.5 points to easily win the girls meet. The Cowgirls finished second with 42.5 points, while La Pine finished a distant third with 16 points. Sophomore Zach Guthrie was a triple winner for the Cowboys and ran a leg on Crook County's winning 4x100 relay team. Guthrie ran away with the 100, winning by nearly a half second with a time of 11.36. Guthrie then won the long jump with a leap of 21-10.25, before coming back to take first in the 200 with a time of 24.36. "Guthrie drops an 11.3 in the 100 with nobody around him," Brooks said. "Then he ran his first open 200, and it looked like three different races. He starts the 200 and then a lull and then a pickup and then another lull and a pickup and then he hammers down and finishes. He just hasn't learned quite how to run it yet, but that kid has an upside. He works hard and is battling and learning." Noah Chaney, Triston Fischer, Kaden Horton and Guthrie then cruised to victory in the 4x100 relay with Guthrie anchoring the team to a time of 45.62. Guthrie was far from the only Crook County sprinter to have a solid meet. Dominic Langley ran a career-best time of 50.74 to win the 400. Langley ran the time despite being ill. Following the race, he threw up, and he failed to complete any of his other events. "He came in not feeling too hot, and then he ran the 400 and was done for the day," Brooks said. "He said that he hadn't been feeling good all day, and I said, 'Dang man, you dropped that kind of time.' He threw up and stuff and then his mom took him home. He didn't even get to do the high jump. We pulled him out of the triple jump and sent him home." Elijah Becker was the Cowboys' final winner on the track, racing to first in the 110 high hurdles with a time of 18.30. Teammate Trevyn Smith was right behind, taking second with a time of 18.35. In addition to Guthrie's win in the long jump, the Cowboys won four other field events. Tyler Humeston took first in the shot put with a throw of 47-02.75, while Caleb Parrott was third in the event with a toss of 42-08.50. Jason Slawter took first in the javelin with a personal best throw of 162-10, while Austin Rochelle was fourth with a throw of 122-02. Rochelle also won the high jump, leaping 5-06. The final Cowboy winner in the field events was Chaney, who won the pole vault with a leap of 13-00. Bend's Wade Jacobus cleared the same height, but Chaney won because he had fewer misses. Other Cowboy placers on the track included Horton and Slawter in the 100. Horton was fourth with a time of 12.21, while Slawter finished sixth in 12.61. Freshman Triston Fischer pushed Guthrie to the finish line in the 200, running a personal record time of 24.66 to finish second. "Our sprinters and jumpers lifted on Tuesday, and ran the hill on Monday," Brooks said. "We are still in that drive phase of the season. We don't really care about meets. They are good training sessions, and we've got to get times, but you know, you pay a price early in the year and take some lumps, but at the end of the year is when it counts." The Cowboys had three placers in the 800, with Cade Catterson finishing second in 2:08.90, while Alec Carne was fourth, 2:13.54, and Logan Tanner finished in fifth with a time of 2:20.19. The Cowboys also had four runners in the JV 800, with all four running faster than 2:20. "We loaded up on the 800," Brooks said. "Right now, we have one through seven of the top in the IMC and that tells us that in our league we've got some depth. That's pretty cool to see. We know that's an area where we can capitalize with the kids that we have and being able to spread them out." Miles Chaney also ran well, picking up a second in the 1,500 with a time of 4:39.63. Becker and Carne also had solid races in the 300 hurdles with Becker taking second in 46.06, while Carne was third in 46.15. Crook County showed their depth again in the 4x400 relay, taking second and third in the meet as Kevin Arroyo, Catterson, Smith and Tanner took second in 3:59.30 while Jordan Graydon, Miles Chaney, Alex Vail and Hunter Eller were third in 4:04.17. In the jumping events, E.J. Allen finished third in the triple jump with a leap of 36-07.25, while Horton was fifth in the long jump with a leap of 17-07.50, and Slawter finished fourth in the pole vault with a clearance of 10-06. In the girls meet, Kenna Woodward was a double winner for the Cowgirls, taking first in both the shot put and discus. Woodward won the shot by 2 feet with a throw of 34-07.50, then won the discus by more than 16 feet with a heave of 116-08. Woodward also took third in the javelin with a toss of 92-06. Teammate Shelby Squire won the event with a throw of 96-11. "Kenna had a great series," Brooks said. "She went 116, which she has done that last year, but she's doing everything building up for the end of the year. It was a good day for her." Marissa Asher also placed in the throws, taking third in the discus with a throw of 99-05 and fifth in the discus with a heave of 28-04, while Squire was sixth in the discus with a toss of 79-09. Jan Carne was the final Cowgirl to win an event, taking first in the 800 with a time of 2:30.44. "Jan ran a lifetime PR," Brooks said. "She's an incredible young lady that is working on her speed and will go to the 1,500." McCall Woodward also ran a personal best in the 800, finishing in fourth with a time of 2:48.20. Other Cowgirls to place on the track included Jacey Allen and Lauren Papke in the 100. The duo finished fifth and sixth with times of 15.22 and 15.27, respectively. Hailey Coffman and Syrie Ossenkop finished fifth and sixth in the 200 with times of 31.12 and 31.41, while Alyson Thomas was second in the 400 with a time of 1:06.02. Kelcie Ames also placed on the track, taking sixth in the 1,500 with a time of 6:05.31, while Jenae Mapes and Messina McClellan were fifth and sixth in the 100 hurdles with times of 19.21 and 20.40, respectively. McClellan and Emmah Barnes placed fifth and sixth in the 300 hurdles with McClellan finishing in 56.36, while Barnes ran a time of 57.39. The Cowgirls also took second in the 4x100 relay with Sofia Langley, Messina McClellan, Tienna Quinn and Faith Wagner running a time of 55.08. Ossenkop, Allen, Coffman and Aubrey Love also took second in the 4x400 relay with a time of 4:44.74. In the jumps, Coffman tied for third in the high jump with a leap of 4-06, while Wagner was second in the pole vault with a leap of 10-06. Love finished fifth in the pole vault with a clearance of 7-06, while Kendall Maycut was fifth in the long jump with a leap of 12-07, and Langley, Wagner and Marli McClellan went four, five, six in the triple jump with leaps of 28-11, 28-07 and 24-03. "They are running banged up, and we are without some of our big guns," Brooks said of both the boys and girls teams. "We have some of our older kids out with injuries, and we had some sickness, but we had some great PRs. Some of our younger kids, it was tic tac toe, three PRs in a row." Brooks added that he expects the injured athletes to be back in a week or two. Crook County has an invitational meet at Lake Oswego on Friday, with field events starting at 4 p.m. and running events scheduled to begin at 5 p.m. The team then has a three-way meet at Summit next Wednesday, April 10. 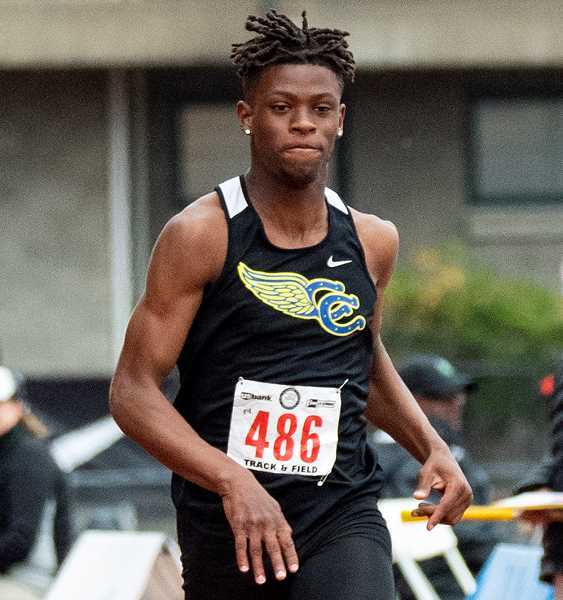 Their big meet of the season follows on Saturday, April 13 when Crook County travels to Coos Bay for the Prefontaine Invitational. Brooks said that is the first meet where the team eases off on their training in an attempt to run good times. "We have some big hitters like Jonas Rice, Emma Hehn and Maggie Ramoss in the hurdles that are out with injuries right now," Brooks said. "We expect to have all of them back by the Prefontaine meet, and we will put them in something. Right now, we are just trying to get people healthy. I'm excited about where we are in our season." Boys team scores — 1. Crook County, 83. 2. Bend, 79. 3. La Pine, 7. Girls team scores — 1. Bend, 122.5. 2. Crook County, 42.5. 3. La Pine, 16. 100 Meters Varsity —1. Zachary Guthrie, Crook County,11.36. 2. Garrett Bishop, Bend, 11.76. 3. Nate Denney, Bend, 11.84. 4. Kaden Horton, Crook County, 12.21. 6. Jason Slawter, Crook County, 12.61. 100 Meters Junior Varsity— 5. Eliab Rice, Crook County, 12.34. 8. EJ Allen, Crook County, 12.7. 10. Erik Gonzalaz, Crook County, 12.76. 11. Kevin Arroyo, Crook County, 12.96. 13. Dakoda Robedeau, Crook County, 13.12. 14. Deusce Catt, Crook County, 13.17. 15. Nathaniel Littrell, Crook County, 13.19. 18. Kyree Willis, Crook County, 13.77. 20. Jacob Moon, Crook County, 14.14. 21. Isaac Logan, Crook County, 14.37. 24. Cameron Bruce, Crook County, 14.64. 200 Meters Varsity — 1. Zachary Guthrie, Crook County, 24.36. 2. Triston Fischer, Crook County, 24.66. 3. Garrett Bishop, Bend, 24.77. 4. Leobardo Bernal-Bacho, Bend, 25.62. 200 Meters Junior Varsity —1. Kaden Horton, Crook County, 25.2. 5. Kevin Arroyo, Crook County, 26.67. 9. Deusce Catt, Crook County, 27.3. 12. Kyree Willis, Crook County, 28.2. 13. Braydon Olsen, Crook County, 28.82. 14. Jacob Moon, Crook County, 29.11. 19. Daniel Olsen, Crook County, 31.21. 400 Meters Varsity — 1. Dominic Langley, Crook County, 50.74. 2. Ty Pierce, Bend, 56.14. 3. Silas Long, Bend, 58.04. 800 Meters Varsity — 1. Bennet Jackson, Bend, 2:03.1. 2. Cade Catterson, Crook County, 2:08.9. 3. Nicolas Engel, Bend, 2:10.9. 4. Alec Carne, Crook County, 2:13.5. 5. Logan Tanner, Crook County, 2:20.2. 800 Meters Junior Varsity— 2. Alex Vail, Crook County, 2:13.9. 3. Hunter Eller, Crook County, 2:16.4. 4. Eric Logan, Crook County, 2:16.6. 5. Roman Stenbeck, Crook County, 2:19.7. 1500 Meters Varsity — 1. Trevor Wilber, Bend, 4:28.8. 2. Miles Chaney, Crook County, 4:39.6. 3. Owen Johnson, La Pine, 4:42.9. 4. Noah Rossi, Bend, 4:43.7. 1500 Meters Junior Varsity — 2. Wyatt Clifton, Crook County, 5:20.9. 6. Jordan Graydon, Crook County, 5:31.2. 8. Jonah Bainbridge, Crook County, 5:47.2. 110m Hurdles - 39" Varsity — 1. Elijah Becker, Crook County, 18.3. 2. Trevyn Smith, Crook County, 18.35. 3. Dru Taft, Bend, 18.53. 4. Nathaniel Everly	, La Pine, 20.2. 300m Hurdles - 36" Varsity— 1. Brady Petz, Bend, 43.44. 2. Elijah Becker, Crook County, 46.06. 3. Alec Carne, Crook County, 46.15. 4. Dru Taft, Bend, 46.68. 4x100 Relay Varsity — 1. Noah Chaney, Triston Fischer, Kaden Horton, Zachary Guthrie, Crook County, 45.62. 2. Bend, 45.85. 3. Elijah Becker, Austin Rochelle, Erik Gonzalaz, Eliab Rice, Crook County, 48.02. 4. La Pine, 48.92. 4x400 Relay Varsity — 1. Bend, 3:44.0. 2. Kevin Arroyo, Cade Catterson, Trevyn Smith, Logan Tanner, Crook County, 3:59.3. 3. Jordan Graydon, Miles Chaney, Alex Vail, Hunter Eller, Crook County, 4:04.2. 4. La Pine, 4:10.0. Shot Put - 12lb Varsity — 1. Tyler Humeston, Crook County, 47-02.75. 2. Tristen Guilfoyle, Bend, 45-03.50. 3. Caleb Parrott, Crook County, 42-08.50. 4. Lucas Musgrave, Bend, 40-11.25. 9. Erik Gonzalaz, Crook County, 34-10.25. Shot Put - 12lb Junior Varsity — 1. EJ Allen, Crook County, 36-11.25. 3. Carson Chamness, Crook County, 35-03.75. 4. Hayden Hilderbrand, Crook County, 31-04.50. 6. Riley Aikins, Crook County, 30-00.25. 8. Wyatt Holiday, Crook County, 28-05.50. 9. Malachi Mullins, Crook County, 27-07.00. 10. Azariah Becker, Crook County, 26-02.50. 11. Jose Villagomez, Crook County, 21-01.00. Discus - 1.6kg Varsity — 1. Wade Jacobus, Bend, 147-02. 2. Tyler Humeston, Crook County, 129-02. 3. Caleb Parrott, Crook County, 124-05. 4. Tristen Guilfoyle, Bend, 121-03. 6. Carson Chamness, Crook County, 111-11. Discus - 1.6kg Junior Varsity — 4. Jason Slawter, Crook County, 92-11. 5. Noah Chaney, Crook County, 89-06. 6. Azariah Becker, Crook County, 87-11. 7. Riley Aikins, Crook County, 79-08. 9. Wyatt Holiday, Crook County, 69-07. 10. Jose Villagomez, Crook County, 61-08. Javelin - 800g Varsity — 1. Jason Slawter, Crook County, 162-10. 2. Wade Jacobus, Bend, 141-01. 3. Grant Harpole, Bend, 126-01. 4. Austin Rochelle, Crook County, 122-02. 6. Noah Chaney, Crook County, 121-09. Javelin - 800g Junior Varsity — 2. Tyler Humeston, Crook County, 122-04. 5. Hayden Hilderbrand, Crook County, 89-09. 7. Riley Aikins, Crook County, 82-03. 10. Azariah Becker, Crook County, 69-04. 12. Malachi Mullins, Crook County, 63-01. 13. Daniel Olsen, Crook County, 62-03. 14. Carson Chamness, Crook County, 58-08. 15. Wyatt Holiday, Crook County, 54-02. 19. Jose Villagomez, Crook County, 40-00. High Jump Varsity — 1. Austin Rochelle, Crook County, 5-06.00. 2. Tracy Turnsplenty, La Pine, 5-02.00. 3. Wade Jacobus, Bend, 5-02.00. 4. Tyler Sechler, La Pine, 5-00.00. 6. Triston Fischer, Crook County, 4-10.00. Pole Vault Varsity — 1. Noah Chaney, Crook County,13-00.00. 1. Wade Jacobus, Bend, 13-00.00. 3. Finnegan Jennings, Bend, 12-06.00. 4. Jason Slawter, Crook County, 10-06.00. 5. Jacobey Hale, Crook County, 9-00.00. Pole Vault Junior Varsity — 1. Isaac Logan, Crook County, 9-00.00. 2. Deusce Catt, Crook County, 8-06.00. 4. Nathaniel Littrell, Crook County, 7-00.00. 5. Azariah Becker, Crook County, 6-06.00. Long Jump Varsity — 1. Zachary Guthrie, Crook County, 21-10.25. 2. Lucas Musgrave, Bend, 20-05.00. 3. Nate Denney, Bend, 18-07.75. 4. Trevyn Smith, Crook County, 17-11.00. 5. Kaden Horton, Crook County, 17-07.50. 6. EJ Allen, Crook County, 17-06.50. Long Jump Junior Varsity — 2. Elijah Becker, Crook County, 17-11.50. 3. Erik Gonzalaz, Crook County, 16-09.75. 5. Dakoda Robedeau, Crook County, 15-05.75. 7. Jacob Moon, Crook County, 14-10.00. 10. Kevin Arroyo, Crook County, 14-04.75. 11. Kyree Willis, Crook County, 13-11.50. 12. Isaac Logan, Crook County, 3-07.50. 13. Cameron Bruce, Crook County, 12-1.00. Triple Jump Varsity — 1. Lucas Musgrave, Bend, 40-03.50. 2. Nate Denney, Bend, 37-04.00. 3. EJ Allen, Crook County, 36-07.25. 4. Cole Persinger, Bend, 35-08.50. 100 Meters Varsity — 1. Maya Hopwood, Bend, 12.28. 2. Katelyn Jolley, Bend, 13.35. 3. Flore Elliott, Bend, 13.66. 4. Hayleigh Michael, La Pine, 15.05. 5. Jacey Allen, Crook County, 15.22. 6. Lauren Papke, Crook County, 15.27. 100 Meters Junior Varsity — 9. Hailey Coffman, Crook County, 15.55. 10. Shelby Squire, Crook County, 15.7. 13. Teagan Nelson, Crook County, 16.72. 200 Meters Varsity — 1. Maya Hopwood, Bend, 25.88. 2. Sydney Gardner, Bend, 28.55. 3. Tienna Quinn, Crook County, 29.83. 4. Messina McClellan, Crook County, 30.65. 5. Sofia Langley	, Crook County, 30.8. 200 Meters Junior Varsity — 5. Hailey Coffman, Crook County, 31.12. 6. Syrie Ossenkop, Crook County, 31.41. 7. Jacey Allen, Crook County, 31.69. 8. Lauren Papke, Crook County, 31.81. 400 Meters Varsity — 1. Michaela Lorenz, Bend, 1:05.0. 2. Alyson Thomas, Crook County, 1:06.0. 3. Ellie Kowalski, Bend, 1:06.3. 4. Allie Wilber, Bend, 1:06.8. 5. Aubrey Love, Crook County, 1:07.2. 6. Sofia Langley, Crook County, 1:09.0. 800 Meters Varsity — 1. Jeanette Carne, Crook County, 2:30.4. 2. Caroline Sherwood, Bend, 2:40.5. 3. Jesy Lopez, Bend, 2:46.8. 4. McCall Woodward, Crook County, 2:48.2. 800 Meters Junior Varsity —5. Grace Brooks, Crook County, 3:01.2. 6. Marli McClellan, Crook County, 3:04.1. 1500 Meters Varsity — 1. Alice McKnight, Bend, 5:27.4. 2. Olivia Flack, La Pine, 5:31.5. 3. Gina Anderson, Bend, 5:44.7. 4. Samantha B. Smith, Bend, 5:53.1. 6. Kelcie Ames, Crook County, 6:05.3. 8. Hannah Dozhier, Crook County, 6:38.0. 1500 Meters Junior Varsity — 3. Emily Mize, Crook County, 6:34.00. 5. Marah Binder, Crook County, 6:56.00. 6. Sammy Thornton, Crook County, 9:05.00. 3000 Meters Varsity — 1. AnneMarie Covlin, Bend, 12:20.6. 2. Faith Lopez, Bend, 12:43.3. 3. Rivers Gross, Bend, 13:08.1. 4. Kadence Gentle, Bend, 13:52.1. 100m Hurdles - 33" Varsity — 1. Sarah Quinlan, Bend, 16.36. 2. Taylor Petz, Bend, 16.59. 3. Flore Elliott, Bend, 17.08. 4. Hayleigh Michael, La Pine, 18.91. 5. Jenae Mapes, Crook County, 19.21. 6. Messina McClellan, Crook County, 20.4. 7. Emmah Barnes, Crook County, 21.48. 100m Hurdles - 33" Junior Varsity — 6. Josie Kasberger, Crook County, 22.57. 300m Hurdles - 30" Varsity — 1. Grace Toney, Bend, 48.32. 2. Taylor Petz, Bend, 51.99. 3. Kealy McCormack, Bend, 55.17. 4. Hayleigh Michael, La Pine, 56.29. 5. Messina McClellan, Crook County, 56.36. 6. Emmah Barnes, Crook County, 57.39. 4x100 Relay Varsity — Bend, 50.89. 2. Sofia Langley	, Messina McClellan, Tienna Quinn, Faith Wagner, Crook County, 55.08. 3. La Pine, 56.86. 4x400 Relay Varsity — 1. Ellie Kowalski, Bend, 4:23.4. 2. Syrie Ossenkop, Jacey Allen, Hailey Coffman, Aubrey Love, Crook County, 4:44.7. Shot Put - 4kg Varsity — 1. Kenna Woodward, Crook County, 34-07.50. 2. Dakota Underwood, La Pine, 32-07.00. 3. Autumn Gerard, La Pine, 30-04.00. 4	. Micayla Johnson, Bend, 30-01.50. 5. Marrisa Asher, Crook County, 28-04.50. Shot Put - 4kg Junior Varsity — 2. Josie Kasberger, Crook County, 26-07.00. 7. Leahlynn Cates, Crook County, 25-05.00. 10. Shelby Squire, Crook County, 24-05.50. 11. Patsy Wagner, Crook County, 23-08.00. 12. Heather Ptomey, Crook County, 22-09.00. 15. Marah Binder, Crook County, 18-09.50. 16. Jiselle Gish, Crook County, 18-04.50. 18. Abbigail Chaney, Crook County, 18-01.00. 20. Sammy Thornton, Crook County, 15-01.00. Discus - 1kg Varsity — 1. Kenna Woodward, Crook County, 116-08. 2. Autumn Gerard, La Pine, 100-02. 3. Marrisa Asher, Crook County, 99-05. 6. Shelby Squire, Crook County, 79-09. Discus - 1kg Junior Varsity — 2. Lauren Papke, Crook County, 74-01. 4. Josie Kasberger, Crook County, 73-08. 5. Grace Brooks, Crook County, 68-07. 7. Patsy Wagner, Crook County, 64-10. 10. Jiselle Gish, Crook County, 61-09. 11. Malorie Thompson, Crook County, 60-08. 12. Heather Ptomey, Crook County, 52-03. 13. Abbigail Chaney, Crook County, 49-09. Javelin - 600g Varsity — 1. Shelby Squire, Crook County, 96-11. 2. Siera Crawford, Bend, 93-10. 3. Kenna Woodward, Crook County, 92-06. 4. Trinity Barudoni, Bend, 90-05. Javelin - 600g Junior Varsity — 1. Josie Kasberger, Crook County, 78-05. 5. Heather Ptomey, Crook County, 61-05. 6. Marrisa Asher, Crook County, 57-07. 7. Teagan Nelson, Crook County, 56-07. 8. Grace Brooks, Crook County, 56-00. 9. Malorie Thompson, Crook County, 54-02. 10. Jiselle Gish, Crook County, 47-04. 11. Patsy Wagner, Crook County, 45-03. 12. Abbigail Chaney, Crook County, 36-05. High Jump Varsity — 1. Devon Lizza, Bend, 4-08.00. 2. Makenna Nelson, Bend, 4-08.00. 3. Kamrin Williams, Bend, 4-06.00. 3. Hailey Coffman, Crook County, 4-06.00. 5. Leahlynn Cates, Crook County, 4-04.00. 6. Kendall Maycut, Crook County, 4-04.00. Pole Vault Varsity — 1. Taylor Petz, Bend, 11-00.00. 2. Faith Wagner, Crook County, 10-06.00. 3. Elishka Pierce, Bend, 10-00.00. 4. Siera Crawford, Bend, 10-00.00. 5. Aubrey Love, Crook County, 7-06.00. Pole Vault Junior Varsity — 2. Abbigail Chaney, Crook County, 6-00.00. Long Jump Varsity — 1. Leah Richards, Bend, 17-01.50. 2. Charli Stewart, Bend, 16-01.00. 3. Makenna Nelson, Bend, 15-11.50. 4. Emily Aarness, La Pine,	12-10.00. 5. Kendall Maycut, Crook County, 12-07.00. Long Jump Junior Varsity — 5. Emmah Barnes, Crook County, 12-05.50. 6. Marli McClellan, Crook County, 10-06.50. Triple Jump Varsity — 1. Leah Richards, Bend, 35-11.25. 2. Sarah Quinlan, Bend, 33-07.75. 3. Makenna Nelson, Bend, 30-03.50. 4. Sofia Langley, Crook County, 28-11.00. 5. Faith Wagner, Crook County, 28-07.25. 6. Marli McClellan, Crook County, 24-03.00. Triple Jump Junior Varsity — 3. Elise Rice, Crook County, 27-04.00. 100 Meters Varsity — 1. Tanner Nauta, Molalla, 11.31. 2. Arthur Katahdin, Unattached, 11.39. 3. Simon Dexter, Churchill, 11.48. 4 Dustin Baze, Central Linn, 11.59. 5. Nick Lucas, Molalla, 11.73. 6. Gage Garner, Redmond, 11.74. 6. Spencer Sloan, Unattached, 11.74. 8. Evan Smith, McMinnville, 11.77. 21. Noah Chaney, Crook County, 12.17. 23. Elijah Becker, Crook County, 12.28. 26. Jason Slawter, Crook County, 12.31. 36. Cameron Whitney, Crook County, 12.99. 48. Isaac Logan, Crook County, 14.2. Long Jump — 1. Jack Normand, Summit, 6.55m. 2. Simon Dexter, Churchill, 6.49m. 3. Tristan Calkins, Sweet Home, 6.26m. 4. Evan Smith, McMinnville, 6.04m. 5. Spencer Sloan, Unattached, 5.96m. 5. Logan Stamm, Estacada, 5.96m. 17. Elijah Becker, Crook County, 5.41m. 21. Jason Slawter, Crook County, 5.22m. 24. Noah Chaney, Crook County, 5.14m. 42. Cameron Whitney, Crook County, 4.49m. Shot Put - 12lb — 1. Arthur Katahdin, Unattached, 12.61m. 2. Aiden Jones,Paisley, 12.28m. 3. Anthony Anderson, Central Linn, 12.26m. 4. Noah Moore, Sweet Home, 12.12m. 5. Evan Smith, McMinnville, 11.68m. 6. Spencer Sloan, Unattached, 11.64m. 13. Jason Slawter, Crook County, 10.65m. 29. Elijah Becker, Crook County, 9.22m. 31. Noah Chaney, Crook County, 9.00m. 40. Cameron Whitney, Crook County, 8.16m. 44. Isaac Logan, Crook County, 7.83m. High Jump — 1. Jack Normand, Summit, 1.98m. 2. Skyler Larson, Sisters, 1.86m. 3. Jerry Patzke, Lakeview, 1.77m. 3. Spencer Sloan, Unattached, 1.77m. 3. Nick Lucas, Molalla ,1.77m. 3. Evan Smith, McMinnville, 1.77m. 3. Arthur Katahdin, Unattached, 1.77m. 3. Brody Davidson, Santiam, 1.77m. 28. Noah Chaney, Crook County, 1.47m. Isaac Logan, Crook County, NH. Elijah Becker, Crook County, NH. Jason Slawter, Crook County, NH. 400 Meters Varsity — 1. Casey Tow, Sweet Home, 52.17. 1. Turner Nye, North Medford, 52.17. 3. Simon Dexter, Churchill, 52.55. 4. Noah Dinsfriend, Sweet Home, 54.01. 5. Tristan Calkins, Sweet Home, 54.16. 6. Dustin Baze, Central Linn, 54.48. 9. Noah Chaney, Crook County, 54.92. 26. Jason Slawter, Crook County, 57.93. 36. Elijah Becker, Crook County, 01:02.1. 46. Isaac Logan, Crook County, 01:14.6. Cameron Whitney, Crook County, SCR. 110m Hurdles — 1. Arthur Katahdin, Unattached, 16.06. 2. Turner Nye, North Medford, 16.09. 3. Noah Dinsfriend, Sweet Home, 16.29. 4. Simon Dexter, Churchill, 16.37.5. Colby Thompson, Lakeview, 17.1. 6. Nick Lucas, Molalla, 17.21. 10. Elijah Becker, Crook County, 18.01. 15. Noah Chaney, Crook County, 19.14. 39. Jason Slawter, Crook County, 23.27. 44. Isaac Logan, Crook County, 25.92. Cameron Whitney, Crook County, SCR. Discus — 1.6kg - 1. Gage Garner, Redmond, 38.42m. 2. Arthur Katahdin, Unattached, 37.73m. 3. Spencer Sloan, Unattached, 34.43m. 4. Luke VanSmoorenburg, Molalla, 33.89m. 5. Aiden Jones, Paisley, 32.04m. 6. Jackson Buresh, Summit, 31.52m. 19. Noah Chaney, Crook County, 25.34m. 26. Jason Slawter, Crook County, 23.18m. 35. Isaac Logan, Crook County, 19.58m. 40. Elijah Becker, Crook County, 18.21m. Cameron Whitney, Crook County, SCR. Pole Vault — 1. Arthur Katahdin, Unattached, 4.26m. 2. Noah Chaney, Crook County, 4.11m. 3. Garrett Price, 37-Unattached, 3.96m. 4. Simon Dexter, Churchill, 3.81m. 4. Turner Nye, North Medford, 3.81m. 6. Garrett Kersavage, Sisters, 3.65m. 6. Jerry Patzke, Lakeview, 3.65m. 6. Anthony Cruthirds, North Medford, 3.65m. 12. Jason Slawter, Crook County, 3.05m. 23. Elijah Becker, Crook County, 2.59m. 38. Isaac Logan, Crook County, 2.28m. Cameron Whitney, Crook County, SCR. Javelin - 800g — 1. Jason Slawter, Crook County, 48.72m. 2. Evan Smith, McMinnville, 48.51m. 3. Noah Moore, Sweet Home, 48.05m. 4. Casey Tow, Sweet Home, 43.13m. 5. Gage Garner, Redmond ,41.46m. 6. Hudson Jones, Sisters, 41.31m. 19. Noah Chaney, Crook County, 36.13m. 35. Isaac Logan, Crook County, 27.98m. 39. Elijah Becker, Crook County, 26.73m. Cameron Whitney, Crook County, SCR. 1500 Meters Varsity — 1. Dakota Glover, Estacada, 04:45.7. 2. Brody Davidson, Santiam, 04:46.8. 3. Noah Chaney, Crook County, 04:47.2. 4. Riley Chambers, Unattached, 04:50.7. 5. Declan Ritter, Klamath Union, 04:56.3. 6. Casey Tow, Sweet Home, 05:01.7. 42. Jason Slawter, Crook County, 06:58.6. 44. Elijah Becker, Crook County, 06:58.6. 45. Luke VanSmoorenburg, Molalla, 06:58.7. Isaac Logan, Crook County, SCR. Cameron Whitney, Crook County, SCR. Decathlon Score — 1. Arthur Katahdin, Unattached, 5958. 2. Simon Dexter, Churchill, 5457.3. Turner Nye, North Medford, 5431. 4. Casey Tow, Sweet Home, 5252. 5. Spencer Sloan, Unattached, 5173. 6. Evan Smith, McMinnville, 4982. 7. Noah Chaney, Crook County, 4886. 33. Jason Slawter, Crook County, 3511. 37. Elijah Becker, Crook County, 3198.